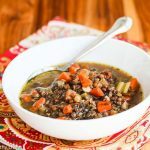 This Slow Cooker Greek Lentil Soup is so simple, yet so satisfying. You’ll be reaching for a bowl of this on a cold winter day. 217 calories/2 Freestyle points per serving. I’ve been sitting on this recipe for way too long so I’m finally getting around to sharing it. 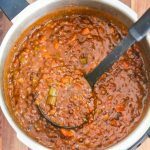 The weather has definitely turned cooler the last couple of weeks, which has prompted me to start making more chili and soups, including this Greek lentil soup, which I made last winter. So, here’s the story behind this lentil soup recipe. It all started when I picked up a cup of lentil soup from a local Greek restaurant one day. A man sitting next to me was raving about how good it was – he said it was better than his Italian mother’s version. So, naturally, that peaked my interest and I just had to have a taste so I ordered a cup to go. I only got one spoonful before it was devoured by my youngest son. The next day, I asked my friend whose husband is Greek for a Greek lentil soup recipe. She dug up a recipe simply called Lentil Soup, or Fakies in Greek. The caption for this recipe says that this soup is the only food eaten by devout Orthodox Christians on Good Friday. The vinegar in the soup is symbolic, recalling that it was given to Christ on the cross. Fascinating – I love learning about stories behind recipes. 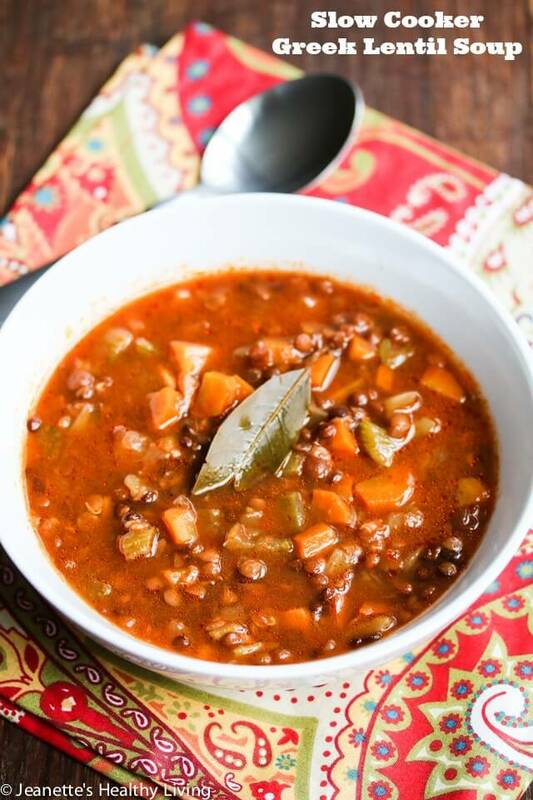 Lentils are a great source of protein and have wonderful flavor in soup. In fact, you can use water instead of stock in this soup recipe and I think it would come out just as good. I used half water and half stock and it was full of flavor. One adjustment I made to the original recipe was to add double the tomato sauce and a few tablespoons of tomato paste to achieve the tomatoey flavor I recalled from the restaurant’s soup. 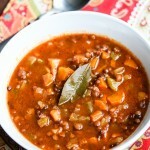 This Greek Lentil Soup was so good, I made it for a friend recently, saving one container for our family. I should have doubled the recipe as it is one of those comfort foods that can be eaten at least a few times a week. I’ve made this soup in the slow cooker and on the stovetop and both yield good results. Just know that cooking on the stovetop will result in a thicker soup, so you may want to add more water or stock. Heat oil in a large stockpot; saute onion, garlic, carrots and celery; cook about 5 minutes until onions are softened. Transfer vegetables to slow cooker. Add water or stock, lentils, tomato sauce, tomato paste, bay leaves, salt and pepper. Cook on low for 8-9 hours until lentils are tender. Remove bay leaves. Stir in vinegar just before serving. 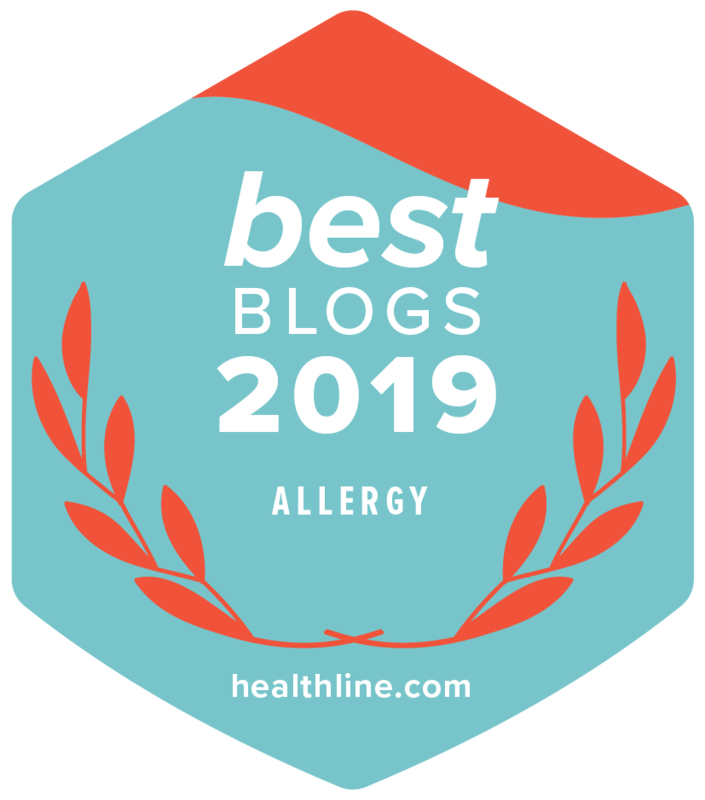 I love love love lentil soup – even though it is not soup weather in Melbourne, Australia so much anymore I think you’ve inspired me to make this anyway! I love lentil soup!!! 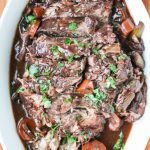 after just a light saute on the stove and then everything into the slow cooker? this is so easy!!! love and pinned!!! can’t wait to try. . I need more soup right now! 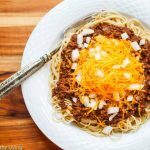 Your photos are gorgeous, and this recipe looks like something my family would adore. 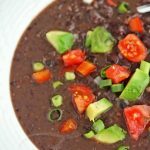 My husband doesn’t eat meat, so I’m always on the lookout for hearty, meatless recipes. This is perfect for Meatless Monday! Just pinned; hope to try it soon. This is so wonderful! 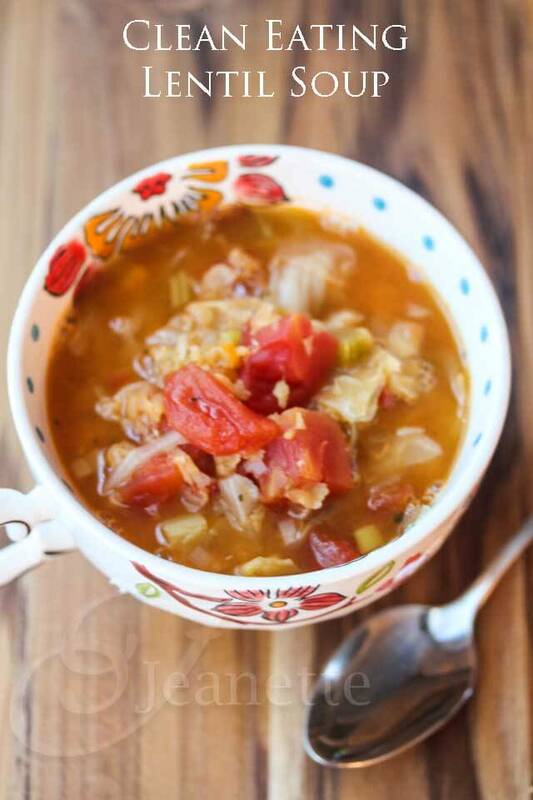 Soup + Slow Cooker + Cold Weather….YUM! Love lentil soup! Will definitely be making this one when I get the craving! 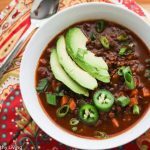 The weather here has also been cooling down and I’m so excited to get right into soups and chili! 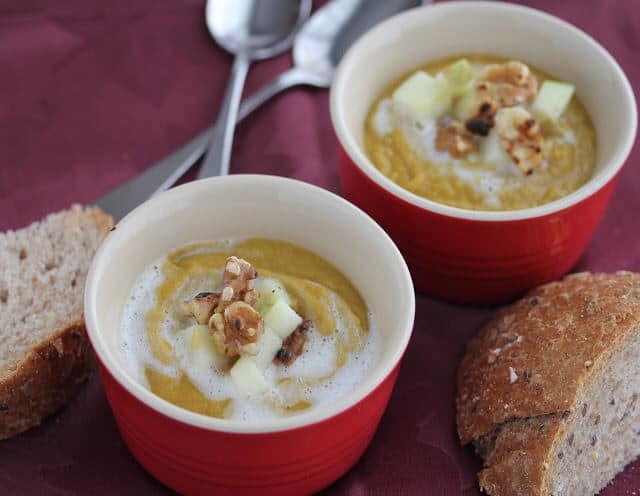 So glad you finally shared this recipe – I adore lentils but never tried them in a slow cooker – Jeanette, your soup looks so wonderful! Thanks Jeanette for the lovely soup recipe. Have a Great Week. This looks delicious – pinned for a cold night! Jeanette, these photos are gorgeous! I love lentil soup (probably because I’m a vegetarian), and this soup sounds perfect for right about now. Hope you had a great weekend! Thanks everyone! We’ve been having some cooler weather so soups have been making their way into our meals lately. 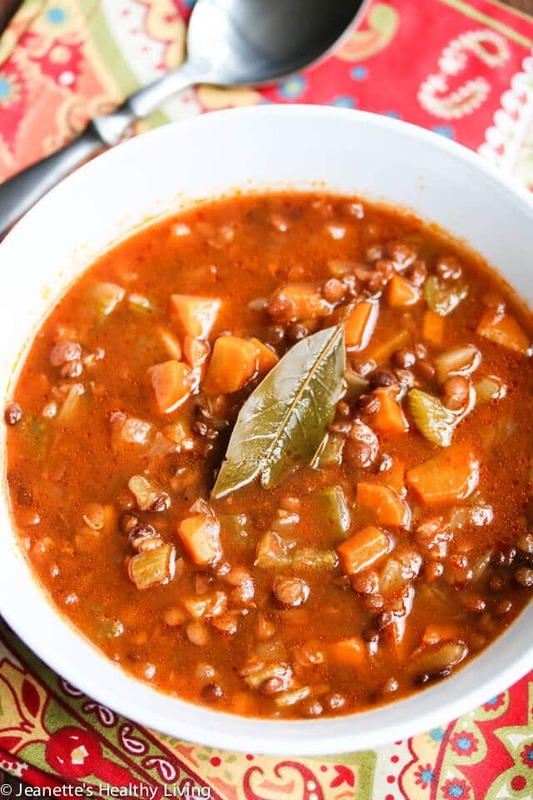 This lentil soup is so simple, but so good. Hope you all have a chance to try it! My mum used to make VATS of lentil soup growing up- this looks so comforting! This soup looks wonderful! I love lentil soup. 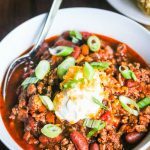 I can’t wait to try making it in the slow cooker now – it’s been so cold here too so soup has been on the menu almost daily. I’ve been craving so much soup lately! Definitely adding this to my “try” list! When it snowed over the weekend, I totally craved a big batch of soup. And maybe some bourbon (because bourbon helps everything). Funny how the change in seasons effects our eating habits. One question: is the 1 cup of green lentils pre-soaked or not? I always pre-soak my green lentils, but I haven’t made them in a slowcooker recipe yet, so I’m not sure if that changes things. Thanks for the great recipe! Angela, I used un-soaked lentils when I measured. Great! We made these last night almost exactly as written and they were a hit with husband and 2 kids (11 and 14.) I used apple cider vinegar instead of red wine vinegar at the end, chicken bone broth for the stock, and unsoaked brown lentils. We used goat feta when serving to make dairy-free. Excellent to come home to on a cold night. Thank you! 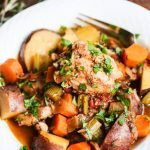 Laurel, so glad you enjoyed this recipe – chicken bone broth sounds fantastic and I like your use of goat feta. It’s been so cold lately, I’m making a pot of this soup over the weekend. I don’t have a slow cooker (yet! ), but this looks great! Going to make it on the stovetop this week! Loved this soup! 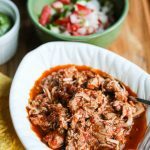 Filling, great flavor and unlike most slow cooker recipes I didn’t get tired of it after a few servings. Thanks Jade – so glad you tried this recipe and enjoyed it. It’s so easy yet so flavorful. I don’t get tired of it either. Making this tonight! Forgive the question – but when you say tomato sauce – do you mean passata or good old tomato sauce – aka ketchup?! Where did the recipe go?!?! I made this once and loved it but now the recipe is not on the website! The recipe is in the post. Sorry we had some technical problems today which have now been resolved. Hi – I’m Greek and I have tot say this recipe is awesome. 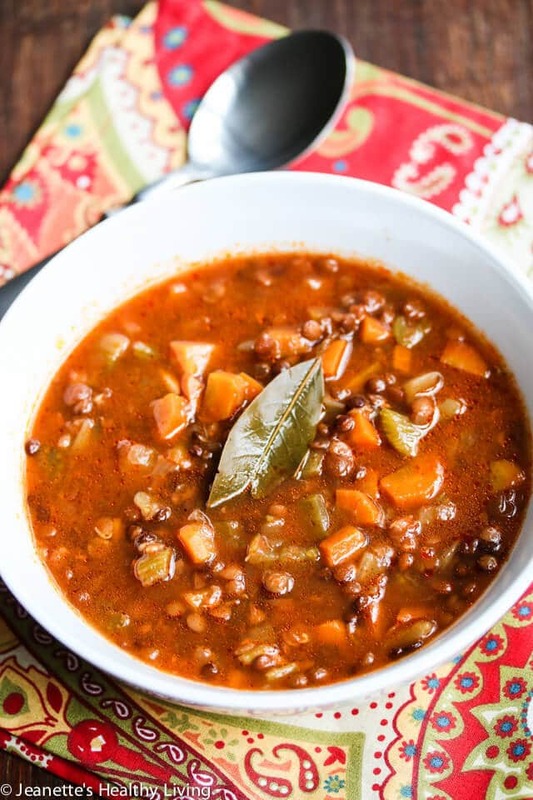 Sometimes lentil soups can be bland and this one was very flavorful. 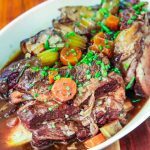 Helen – so glad you enjoyed this recipe! I put the vinegar in early!!! Am in in for a puckery treat?! I think it should be fine Mariella – it actually might be more mellow. Let me know how it turns out.